The Lord Nelson was one of the great finds of my two years in SE1. An increasingly frequent lunchtime haunt, its madcap decor is reason enough to pay a visit if you happen to be in the area, but it’s also well worth making a trip for. Why? Because the bizarre aesthetics happen to house some seriously enjoyable scoff. 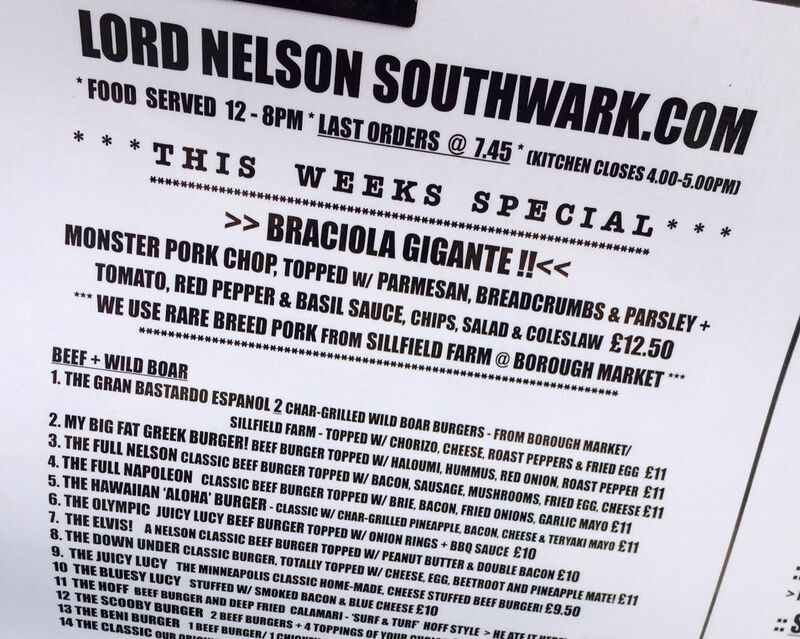 Nearby Borough Market is the driving force behind the menu at the Nelson, and regularly changing specials could include a mammoth pork chop from Sillfield Farm or horse steak courtesy of the Exotic Meat Company. But the mainstay here is the dizzying array of burgers, which come topped with anything from peanut butter to fried calamari. My most recent visits saw me take on a couple of the Lord Nelson’s heftier propositions – the Scooby and the Beni. 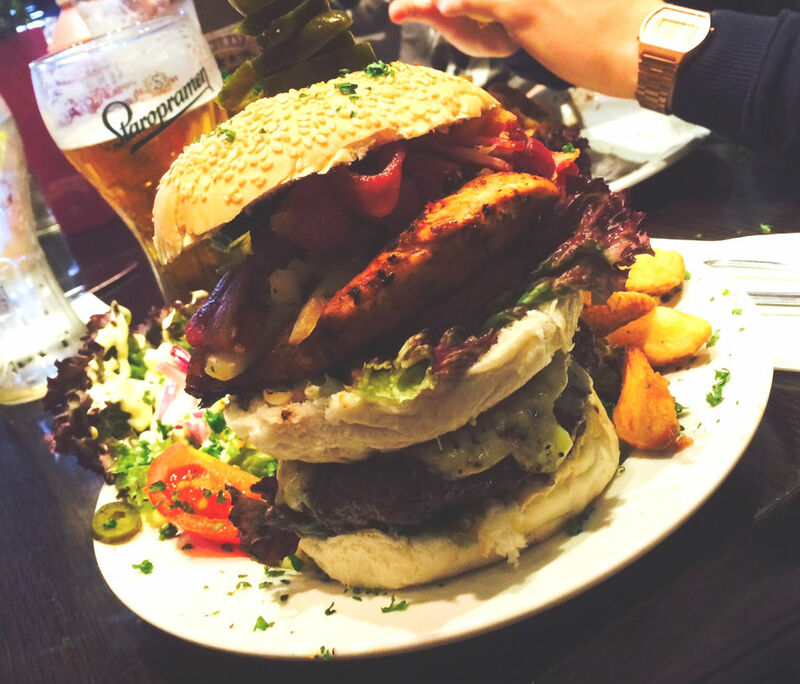 Though the pub doesn’t actively promote it, these are more than worthy Man v. Food-style challenges. Take a look at the photo below (pictured: my version of the double beef Scooby) and I’m sure you’ll agree. If you’re not wearing elasticated trousers on the day, the Juicy Lucy and its stinkier cousin, the Bluesy Lucy, also comes highly commended. 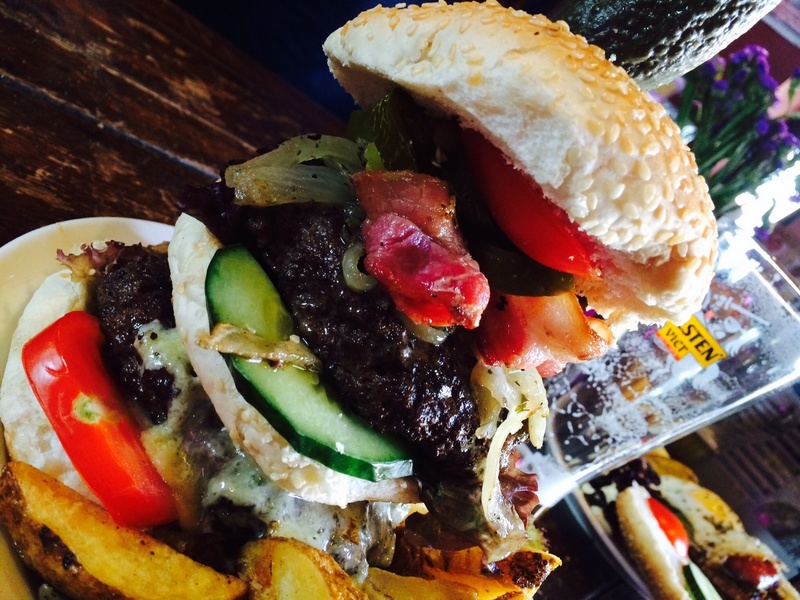 Crucially, the burgers at the Nelson aren’t just for show – they’re damn tasty. Patties are consistently juicy and come a respectable medium, cheese is always perfectly melted, and crispy, home-cooked chips actually taste of potato. There’s also a superb house hot sauce for good measure or, in its occasional absence, a really tasty bought-in substitute. I could, of course, find things to niggle about. There’s a bit too much salad floating about for my liking and the bun isn’t going to stay the course if it’s packed like the chicken and beef combining Beni (below), though otherwise it provides ample armour. The selection of beers could be better, too, as the Nelson stays firmly in lager territory. Yet while we’re far from ‘best in class’ territory, the Lord Nelson’s no-frills food always pleases, proving that you can scarcely go too far wrong when making things by hand from quality ingredients. With friendly staff completing the eccentric atmosphere, the whole place is a waft of virgin oxygen in an area hardly overflowing with interesting boozers and definitely earns the ‘hidden gem’ moniker. It’s the perfect spot for a lazy Friday afternoon work lunch and I’ll definitely be back the next time I’m skulking about the Southwark area. Make sure you check out the Lord Nelson as well. Do you know a hidden gem in London, or anywhere else for that matter? Share your favourite unheralded eating and drinking spots by leaving a comment or moseying on over to @scavgourmet on Twitter. 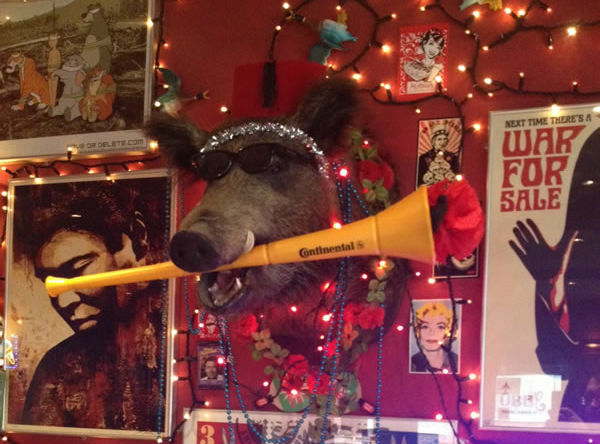 Is Dublin’s Bison Bar home to Europe’s best US-style BBQ joint? What’s the Best Restaurant in Hannover, Germany?